As investors seek rewards from the wild market conditions, they must prepare for greater risks, too. You know exchange-traded funds have arrived when USA Today starts covering leveraged VIX ETPs. With the recent wild market swings, it is not surprising people are talking about VIX exchange-traded products, which track derivatives on an index that goes up when there is fear in the market. Now anyone who understands these exotic products would most likely advise investors to approach with extreme caution, or even stay away completely. But for those who are absolutely set on getting exposure to the VIX index, there is a legitimate case for using the two-times leveraged ones that the article covers – namely the VelocityShares Daily 2x VIX Short Term ETN (TVIX) and the ProShares Ultra VIX Short-Term Futures (UVXY). The recent market turmoil has proved this yet again. The reason is simple: Leveraged VIX ETFs get the closest to “spot” VIX on those days when market fear is highest. They don’t capture the whole move, but they get much closer than the mad popular iPath S&P 500 VIX Short-Term Futures ETN ( VXX), which now trades more than Microsoft every day. VXX and others like it don’t actually track the VIX index at all and thus they fall short when it spikes. You can’t make an ETF that holds actual VIX, which is a calculation based on implied volatility on options of the S&P 500 index. This is impossible. However, VIX ETFs do the next best thing — they track front and second month futures on the VIX index. This is something they do exceptionally well and are rarely given credit for. The problem is VIX futures don’t do a good job of tracking pure VIX. Well, unless you leverage up. It is easy to see from the table above just how little of the move in the VIX is actually captured by VXX. Typically, investors get less than half – sometimes a third – of a big move in VIX. While that is still typically more than what double inverse S&P 500 ETFs return on bad days, TVIX and UVXY get much closer to those jaw-dropping spikes in VIX. Of course, any time the reward is higher, so is the risk. TVIX and UVXY will most likely suffer worse on days the VIX drops – as it inevitably does. This was the case on Aug. 26 when the VIX was down 16 percent while VXX was down 9 percent and TVIX and UVXY were both down 18 percent. It just depends on how badly someone wants to capture the actual VIX on a given day. While TVIX and UVXY are virtually the same performance-wise, they are very different structurally. TVIX is an exchange-traded note (ETN), which is an unsecured debt obligation backed by Credit Suisse. So there is credit risk when investing in it. Also, an ETN doesn’t have to hold actual VIX futures but is rather just a promise to pay the returns of a VIX futures index. 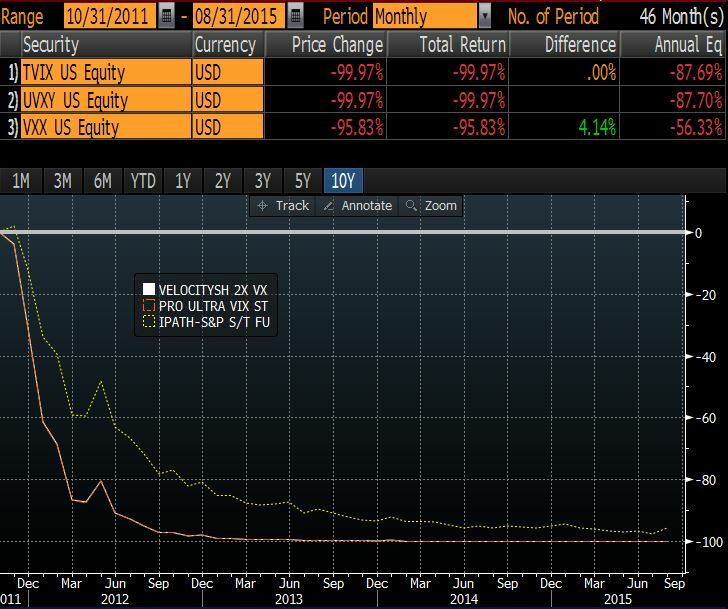 On the flip side, UVXY is a traditional ETF, which means it actually holds the VIX futures. The upside to this is there is no credit risk. The downside is it’s taxed as a partnership, which means a slightly higher rate that is also marked to market every year and requires a different tax form. This is in contrast to an ETN, which is taxed just like a regular stock or equity ETF. The choice between the two comes down to which poison you’d rather stomach: credit risk or alternative tax treatment. Investors seem pretty split, with each at about the $300 million mark in assets. However, both of these products are down more than 99 percent since inception. VXX isn’t much better, down 96 percent as seen in the chart below. This destruction is due to the crippling cost of rolling VIX futures – where almost always the next month is more expensive than the current month. Despite this horrifying chart, the three of them have taken in over $11 billion in cash from investors since inception. Yet, shockingly, they have under $2 billion to show for it today. In other words, investors have seen about $9 billion in cash go up in smoke in these products. The good news is it appears as though no one is buying and holding them. VIX ETFs on average turn over about 115 percent a day. And on the most recent Black Monday, they traded $12 billion, which is close to 400 percent turnover in one day. That’s more than stocks turn over in a year! VIX is one of the rare areas in ETF Land where it is actually healthy to see ridiculous turnover numbers. The more they trade, the more they are being used correctly for the hot potatoes that they are. And for those who want as much of that VIX move as possible, the hotter the potato the better. “Despite where the markets are in equities, we have not seen money being put to work," Larry Fink told CNBC.